Ertholmene is a group of small islands north-east of Bornholm. There are ferries from Gudhjem, Allinge-Sandvig, and Simrishamn. There is a natural harbour between Frederiksø and Christiansø, where you can put your yacht. There are no cars on the islands, so you have to walk. There are only about 100 inhabitants living on Ertholmene, but thousands of visitors come every summer. The islands are: Christians', Frederiksø, and Græsholm. The Great Tower. Build in 1684, lighthouse added in 1805. Entrance DKK5, there is a great view over the islands from the top. 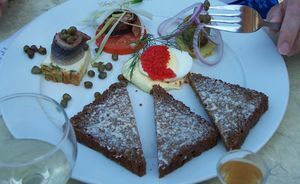 Christinsø is famous for its marinated herrings. Slåensnaps (Blackthorn Schnapps) is a local cpeciality. Ertholmene has 6 hotelrooms and a camping area. Or you cal sleep in your own yacht. This page was last edited on 20 October 2011, at 21:14.